Complement and compliment sound alike, but their meanings are different. Complement may be a noun meaning something that completes something else or makes perfect. As a noun it may also refer to a grammar term, as in subject complement. It may also be a verb meaning to make whole. Compliment may be a noun meaning admiration or praise, or it may be a verb meaning to give admiration or praise. 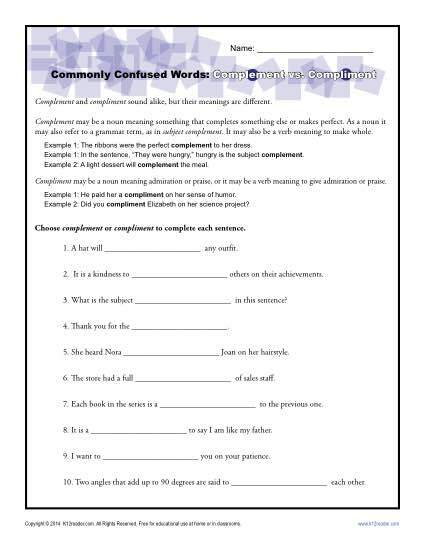 Choose complement or compliment to complete each sentence in this printable worksheet.